Please complete the submission form including the animal's full signalment, a pertinent clinical history and your clinical impression/differential diagnoses. For histopathology specimens, please indicate whether the tissue is an incisional or excisional biopsy. This information will ensure correct interpretation of the pathologist's findings. All specimens should be labelled with at least the name of the animal and the owner so that the identification of the specimens can be verified. Tissue should be fixed in 10% neutral buffered formalin. The optimal ratio of tissue to formalin is 1 part tissue: 10 parts formalin. Handle tissue with care to avoid compression or stretch artefacts. If the tissue to be submitted is thicker than 1cm, incisions can be made into the tissue to allow penetration of the fixative. However, please do not section all the way through the tissue as this will interfere with orientation and margin evaluation. Please leave the circumferential and deep margins intact. Margins of concern can be inked, marked with suture material and/or shaved margins can be submitted. When submitting very large specimens for histopathology, please contact one of the pathologists to discuss the best method for submission. Please note that samples containing bone will require decalcification prior to processing which will delay turnaround time depending on the size of the sample. In most cases, however, any surrounding soft tissue involved in the lesion will be evaluated routinely and an interim report will be given. All specimens should be securely packaged. The tissue should be submitted in a wide-mouth, screw-top and leak-proof container (NOT glass). The container must be wrapped in absorbent material and placed in a sealable plastic bag prior to posting in an envelope. Please complete our ophthalmic histopathology submission form. The lesions of interest can be recorded on the diagrams provided and this will aid their localisation by the pathologist. A good history is invaluable and contributes to the final interpretation of gross and histopathological findings. Trim away excess extraocular tissue unless it is affected by the disease process as this aids penetration of the fixative. Extraocular tissue includes the eyelids, fat, glandular tissue and muscle. If using the palpebral enucleation technique, the eyelids can remain fixed to the globe and any excess extraocular muscle and fat trimmed off prior to fixation. Please do not trim away extraocular tissue if you are sending in tissue for which you require surgical margin assessment e.g. excision of an orbital mass or if the lesion is contained within the extraocular tissue itself. The intact globe should be fixed as quickly as possible to prevent dessication. In addition, the retina is prone to rapid autolysis following enucleation and this can be worsened by delayed fixation. The globe should be fixed intact. Do not incise the globe as this leads to collapse and distortion. It is also not necessary to inject the fixative into the eye and you can create artefact in doing so. 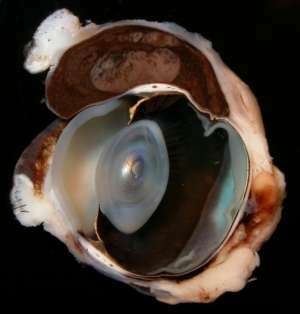 For the majority of ocular diseases, fixation in 10% formalin is more than adequate using a volume ratio of 10:1. If necessary, the globe can be fixed in the appropriate volume of formalin for 24-48 hours and then placed in a smaller volume for posting. If you have any queries, please contact Emma Scurrell or Alex Civello in the first instance. Please see section on 'cytology sample advice' - located at the end of the section. This is a case of a conjunctival melanoma in cat - an example of when you do not want to trim off the extra-ocular tissue when submitting the globe for histopathology.